One of the major concerns for any business is the factor of security. The installation of reliable system plays a vital role to assure maximum security, both internally and externally. The adoption of Access Control and Time-Attendance solution and deployments in different sized organizations have gained prominence and has evolved profoundly over the years. Still, the door controllers used for authentication have their own limitations when aesthetics and performance are prime aspects and objective of any security needs of any organization. Moreover, the performance of door controller fails when the installation is for critical outdoor deployments and when it comes to next generation connectivity. Matrix COSEC ARGO is a performance, design and engineering wonder that will revolutionize the way organizations resolve security challenges of protecting valuable assets and employee. 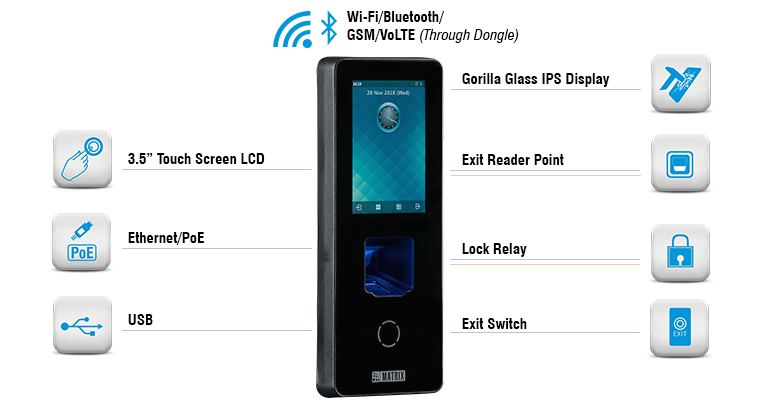 It is an intelligent next generation biometric door controller with an enhanced 3.5’’ IPS Touchscreen LCD for a visually splendid experience. The Performance and Elegance Redefined – COSEC ARGO is an universal device for multiple applications such as Access Control, Time-Attendance, Cafeteria management and Job Processing & Costing that removes the need of dedicated hardware for diverse solutions. The New Age COSEC ARGO provides enhanced scratch proof and impact resistance with IPS LCD touchscreen display. It’s a complete door controller for high-performance Access Control and Time-Attendance applications suitable for various usage installations such as Office Main Entry, Reception, Floor Main Entrance, Server Room and more.